← Poly Cotton 101 & All its Attributes! Halloween has been one of the most popular days in the United States for years. On this day, people dress up in costumes just for show, sometimes it seems as if it’s a competition. If you love doing different crafts and creating new looks, you would love to create your own Halloween costume. Not only will this costume be unique, but you can put your own special touch to it. 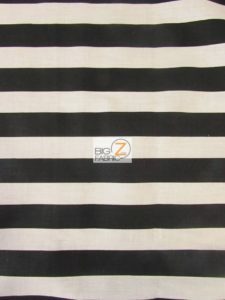 We have 1” stripe fabric that’s black and white and sold by the yard. 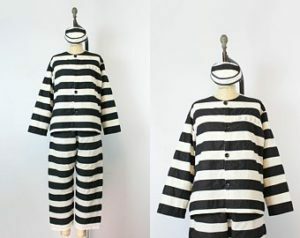 It would be perfect for a striped inmate costume! This cotton fabric is extremely soft and is very high-quality fabric. It is easy to use to make a costume, shirts, pants, and other garments. The material does not stretch, so keep in mind when creating the sizes you will need. You can order a sample of the fabric for only one dollar or go ahead and order enough to make your unique costume at only $3.40 a yard. The price of this fabric is unbeatable! This entry was posted in Hearts Poly Cotton Fabric and tagged black and white, black and white striped, Poly-cotton, striped fabric. Bookmark the permalink.